The early prediction and subsequent detection of an O2 atmosphere on Europa, coupled with the discovery that Europa has an ocean under its ice mantle, has made this moon a prime astrobiologic target, soon to be visited by the JUICE and Europa Clipper spacecraft. Ganymede's atmosphere is produced by radiative interactions with its surface, sourced by the Sun and the Jovian plasma. The sputtered and thermally desorbed molecules are tracked in our Exospheric Global Model (EGM), a 3-D parallelized collisional model. The evolution of Europa's water-product exosphere over its 85-hour day, based on current models, has not been shown to exhibit any diurnal asymmetries. Here we simulate Europa's exosphere using a 3-D Monte Carlo routine including, for the first time, the role of Europa's rotation on the evolution of exospheric molecules throughout the orbit. A University of Cincinnati geology student is helping NASA determine whether life existed on other planets. The water content of magma oceans is widely accepted as a key factor that determines whether a terrestrial planet is habitable. Water ocean mass is determined as a result not only of water delivery and loss, but also of water partitioning among several reservoirs. In a laboratory experiment that mimics astrophysical conditions, with cryogenic temperatures in an ultrahigh vacuum, scientists used an electron gun to irradiate thin sheets of ice covered in basic molecules of methane, ammonia, and carbon dioxide. About 252 million years ago, more than 90 percent of all animal life on Earth went extinct. This event, called the "Permian-Triassic mass extinction," represents the greatest catastrophe in the history of life on Earth. Here, we evaluate our nearest planetary neighbor, Venus, as an exemplar of the runaway greenhouse state that bounds the inner edge of the habitable zone. Despite its current hellish surface environment, Venus may once have been habitable with oceans of surface liquid water. It is commonly understood that the dinosaurs disappeared with a bang - wiped out by a great meteorite impact on the Earth 66 million years ago. The search for habitable and inhabited environments beyond our planet commonly focuses on analogs to Earth, especially in the case of exoplanets. Observations from ground-based facilities, satellites, and spacecraft have yielded a rich collection of data that can be used to effectively view a distant Earth within the context of exoplanet characterization. 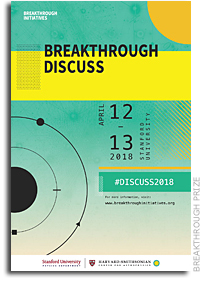 The third annual Breakthrough Discuss scientific conference, which will bring together leading astrobiologists, astronomers, engineers, and astrophysicists to advance discussion around recent discoveries of potential life in the Universe and novel ideas for space exploration, will be held on Thursday, April 12 and Friday, April 13, and full sessions will be available for live viewing on YouTube. The two days of discussions will focus on "Alien Life: Diversity in the Universe," with sessions discussing the search for life in our solar system, possibilities for non-terrain life in the Universe, as well as progress in novel space propulsion. The conference will be live streamed on the Breakthrough Prize's YouTube page. Viewers are encouraged to participate virtually via a chat feature, which will be monitored by a facilitator who will feed questions into the panel discussion sessions. A well-known experiment with young people bouncing a ball showed that when an observer focuses on counting the passes, he does not detect if someone crosses the stage disguised as a gorilla. Researchers from the University of Texas Institute for Geophysics (UTIG) have helped discover the first subglacial lakes ever found in the Canadian High Arctic. A telescope in outback Western Australia has been used to listen to a mysterious cigar-shaped object that entered our Solar System late last year. Arizona State University's School of Earth and Space Exploration recently released new research on its flagship Smart Course, Habitable Worlds, published in the peer-reviewed journal, Astrobiology. Around 4 billion years ago, Earth was an inhospitable place, devoid of oxygen, bursting with volcanic eruptions, and bombarded by asteroids, with no signs of life in even the simplest forms. Proxima b is a terrestrial-mass planet in the habitable-zone of Proxima Centauri. Proxima Centauri's high stellar activity however casts doubt on the habitability of Proxima b. Giant Planets: Good Neighbors For Habitable Worlds? The presence of giant planets influences potentially habitable worlds in numerous ways. Massive celestial neighbors can facilitate the formation of planetary cores and modify the influx of asteroids and comets towards Earth-analogs later on. It has recently been argued from a laser engineering point of view that there are only a few magic colors for optical SETI. These are primarily the Nd:YAG line at 1064 nm and its second harmonic 532.1 nm. Developments in artificial intelligence may help us to predict the probability of life on other planets, according to new work by a team based at Plymouth University. By studying liverworts - which diverged from other land plants early in the history of plant evolution - researchers from the Sainsbury Laboratory at the University of Cambridge have found that the relationship between plants and filamentous microbes not only dates back millions of years, but that modern plants have maintained this ancient mechanism to accommodate and respond to microbial invaders. Intense radiation could strip away the ozone layer of Earth-like planets around other stars and render them uninhabitable, according to a new study led by Dr Eike Guenther of the Thueringer Observatory in Germany. Theories about the early days of our planet's history vary wildly. Some studies have painted the picture of a snowball Earth, when much of its surface was frozen. Other theories have included periods that would be inhospitably hot for most current lifeforms to survive.